OK, so you know you need a storage unit in Laurel, MD. How much space do you need? We will focus on 5’x5′, 5’x10′, 10’x10′, 10’x15′, and 10’x20′. There are bigger spaces, too. Let’s say you have a one-bedroom apartment. For starters, note that if you have a tape measure, you can use your own apartment or house as reference for how big these spaces are. To get an idea for how big a 5’x10′ is, for example, start in the corner of your living room and measure 5′ in one direction and 10′ across. Generally storage units are at least 8′ tall, and that most are taller than that at American Patriot Self Storage. Can you fit your sofa, bed, lamps, chairs, tables, and miscellaneous boxes in that space, if you stacked everything up? If not, measure out a 10’x10′ in your living room, and imagine putting everything in it. 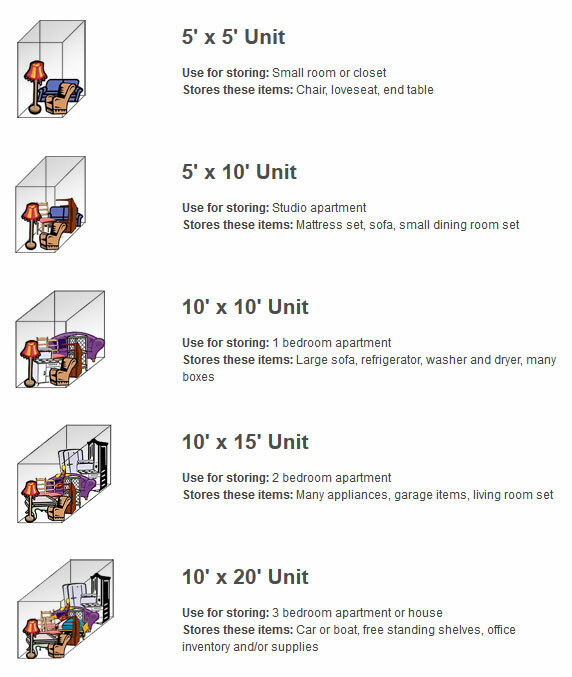 Our estimate, as seem below, is that a 10’x10′ is better for a 1 bedroom apartment. Also note that, unless you have lots of time and like lifting things, it is better to have too much space than too little. It is a pain in the neck (and back) to move from a smaller unit into a bigger one because one sofa simply won’t fit. Of course, we are completely happy to work with you to transfer into a larger unit, if need be. Here is a handy chart that can help you figure out how much space to rent. If you have any questions, feel free to call our friendly staff at 757-397-1990! When you’re checking prices for a storage unit, you probably thinking it is simple: You just want a cheap rate for good space. Well, it can get a little more complicated than that. Keep these six considerations in mind when you’re on your quest. You want your starting rate to be low without compromising quality. As a general rule, self-storage facilities do not take responsibility if your things get damaged. The typical self-storage lease make it clear that you are moving in at your own risk, so professionally managed facilities usually require that you get insurance to cover any losses (see item 2). With this in mind, some facilities offer low prices because their buildings have deferred maintenance problems: a leaky roof, units that tend to flood during storms, rodent or pest issues, and so forth. Before you move in, inspect the unit you’re moving into and its surrounding areas. Is there evidence of water damage on the roof? How does it smell? If you notice anything fishy, ask the manager about it before you move in and see if you’re comfortable with the answer. Above all, use your best judgment before you move in to your unit. Of course, some storage facilities offer low rates but high quality units. Sometimes managers price aggressively simply because they have a lot of space to fill. These deals don’t always last, though, so if you see a good rate, know that it could go away within hours. Units might have climate control or humidity control. Climate control generally means that the facility will protect your unit against extreme temperatures. The range might be 50-85 degrees. That’s not like office space, where human comfort is the concern. The big idea is to reduce the expansion and contraction that comes with extreme temperature. Air conditioning and heating also help control humidity levels. With humidity control units, facilities employ dehumidifiers to keep your unit dry. They probably aim to keep humidity below 60%. Keeping humidity down protects against moisture damage. Mold tends to thrive when humidity rises above 60% or 65%, which can cause problems with your cardboard boxes and wooden/cloth furniture. Remember, airflow probably isn’t great in your storage unit, especially if your items are tightly packed in. Side note: that if you move when it’s rainy, your items might get moldy because you brought the moisture into your unit. If something is wet, dry it off and let it air out before you let it sit still in a storage unit for months. Consider putting it on 4x4s or on a pallet so that it isn’t in direct contact with the floor. Climate control and humidity control don’t guarantee absolute protection of your items, but they do help. If you’re storing items that are sensitive to extreme temperatures, it may make sense to look for a climate controlled unit. Ask about the facility’s admin fees and insurance charges. Some facilities charge extra high one-time admin fees of $24 or even $30. Sure, there’s work involved with renting a unit to a tenant, so it makes sense to charge something. Still, $24 is high. $15 is fair. Most facilities these days require that you have insurance covering what you’re storing. They offer “tenant insurance” programs that fulfill this requirement. These programs are actually quite good and worth the money. If, God forbid, there’s a robbery, fire, damage from pests, or other unpredictable mishap, you need some sort of recourse. A good rate is $9 per month for $2,000 of coverage, with no deductible. If you’re storing items that are more valuable than that, you should consider getting a higher amount of coverage. Many facilities offer a free month deal and/or a free lock. Check out their website and ask the manager. Do you know you’ll be at a facility for twelve months? Some facilities also give a free month if you pay in advance. Sometimes storage facilities start you out at a low rate, wait till you have moved in, and then increase your rate dramatically after a couple months. You can easily imagine the horror stories: Sally’s rate was increased by $100 per month, she wasn’t in a position to move her items out, and she couldn’t afford the new rate. The facility auctioned off her belongings because she couldn’t keep up with the bill. Sally thought she was getting a good deal, but she ended up losing her belongings. It’s like the subprime mortgage crisis all over again. So, ask your facility how long they guarantee your rate. Not every facility has a good referral program, so be sure to ask. With a good referral program you can get months and months of free rent over the course of your lease through referrals. A typical referral credit is $25 per customer who moves in. Admin Fees are $10, which is a steal. We guarantee prices for 12 months after move-in. We offer both climate-controlled and regular units. $2,000 coverage of insurance is $9 per month. $0 deductible. Our referral program offers $25 credit per customer you refer.